Sim Tower, just like its predecessors and prodigies is a massive strategy game that takes an expert player with patience and luck to complete. No matter who you are, I’m sure at least one time in your life or anther, you have been consumed by a Sim game for hours upon hours like a mad scientist in his laboratory. Sim Tower was no different when it came to fundamentals. There are things you should, and should not do. If you choose poorly, the effects may not be obvious instantly, but they pop out 2 minutes or 2 hours later. 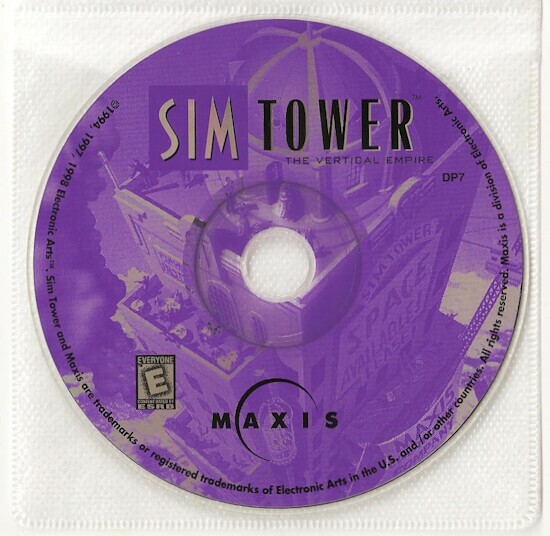 The flexibility of the Sim games has always drawn me close in search of the ultimate challenge; and compared to the earlier games, Tower is definitely a step up in difficulty. You’ll find things going wrong, horribly wrong just when you think you’re out of the red. There are many disasters to strike you off-guard and it really takes someone with determination to give this game a good run. 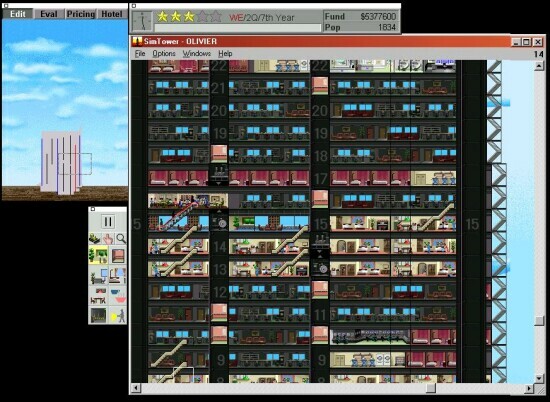 Sim Tower, like many of the Sim games is easy to get used to. There are a few different pallets showing you what you can use to build, your money, and various other customizable things. That’s one of the great things about this game. It is VERY customizable. You can change the height of floors, the capacity of an elevator and its efficiency level. Sim Towers is like an open book that punishes you for not reading it. But lets start off from scratch. You have a baron landscape, 2 million dollars, and a heck of a lot of ambition. The first and logical step is to build a lobby for your visitors and tenants. From there on in it’s a matter of building around the lobby. Slap a few sets of stairs in and get some tenants in for a little extra income. It is also up to you to pay close attention to market value of the areas of the building. Because if you have low market value, people aren’t going to want to live there and there goes your livelihood. You can choose from condominiums, businesses and restaurants when you have one star. Of course you’ll be sitting there wondering, “What the hell do I choose?” And the answer to that is whatever you want! The great thing is that there is no set structure for building a tower in this game. Every tower is different. From here, you will see what towers fall to low market value and which ones move on to 2 star towers. Two star towers open up a whole new door. You now have access to hotel rooms which can really bring in a good deal of income, but your tourists wont want to be beside a business during your stay so be careful where you place things. It’s like a virtual eco-system. What you do to one thing can affect everything else in the game. Also, by now, you should have a quite well used elevator and security system downstairs, as both raise land value more than most other things. If you keep yourself in the black ink and out of the red, then hopefully you’ll get enough tenants to grasp the 3 star rating. Three star towers are the beginning of the end for most people. The bar for which you must achieve is set about 200 times higher then the average person can ever get to so if you get to a four star rating, consider yourself a veteran at this game. You need to get 5000 people (that’s right, no lies) to move into your building, and if your like me, that’s about 10 times what my population was at the start of three stars. You now have access to the recycling depot and nursing station so make haste and add them to your building to boost value. Also, try not to build too fast as it leads to poor design and the design of your building can seriously be the difference between failure and success. If you’ve come this far, I salute you for your fine playing skills. But remember, it isn’t over yet folks! By this time you should be pulling your hair out in frustration as your building falls apart and you can do nothing but sit back and watch in horror as your masterpiece that has taken hours upon hours to complete is just put up for sale by the Sim masses. This is the point where you should just quit to save yourself agony later on. C’mon, just sit down, have a beer, take a break. Maybe even watch some TV, just save your strength for what this game throws in your direction next. As I said earlier, Sim Tower is an extremely addictive game. If you’ve ever played a Sim game, then you’ll know what I mean. Sim Tower is especially addictive compared to the others. It is so hard to master that you’ll find yourself wasting hours, maybe even days with this game. 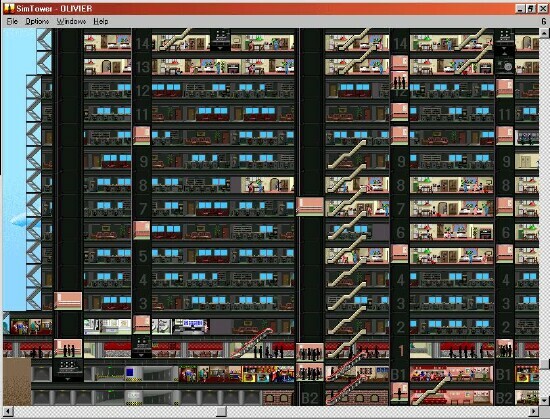 If you a good 90s era simulation that will keep you occupied, you'll find a vast quest with Sim Tower.